We make it easy for you to take your furniture home. Whether you want to pay it up front or take it home and make payments. We strive to offer you the best programs at the lowest cost to own. From No Credit Check financing, to Lay-a-way, there is a way for everyone. Opening a revolving credit line with CB Furniture is the best way to bring home the rooms you desire. Some of the advantages include: Interest-Free Special Financing, Access to Exclusive Cardholder Events, and Low Flexible Payments to fit your budget. To apply simply visit our store and apply in person. If you want to take merchandise home and have bad credit, no credit, or simply don't want your credit score checked, then No Credit Check Financing is for you. Your approval amount is determined on your monthly income. We work with different companies so you can choose the one that works best for you. So, if you happen to get declined for one company, you can always try a different one since it won't affect your credit score. No credit here but we offer free 6 month lay-a-way. Pay at your own rate weekly, bi-weekly,monthly, it's up to you. Once you pay it off bring it home. No interest or charges. Please visit our store to lay-a-way merchandise. 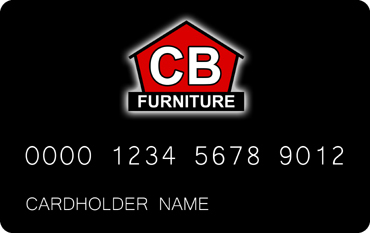 At CB Furniture you can always pay up-front with cash, Visa, MasterCard, American Express, and Discover cards. We work hard to bring you the lowest prices and deals so you can shop knowing that you will get the most bang for your buck!